This week on The Bugcast: Dave gives his selection of favourite tracks from the past year, from Boogie Belgique, Psychostick, Jara, Karissa Hobbs, Anitek, Stellar Art Wars, Bellevue, Manhat10, May, Filthy Kicks, Jeff Oster, David Krystal, Deep Down Inside, The Madpix Project, and madelyniris. 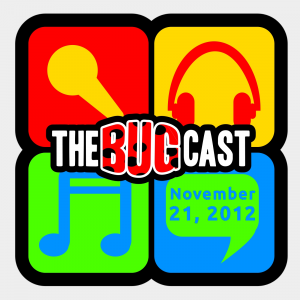 This week on The Bugcast: On this non-live show with live listeners, we play our usual great mix of 8 great tracks of Creative Commons music from The A.J. Gatz Project, Filthy Kicks, Manhat10, Crumbsnatchers, Enry, Ty Andelman, Roman Ram Lobashkov, and Christian Kane. Welcome to NaPodPoMo Day 21! Bit of a wash-out on the way into work.